After almost three years, the Evanston History Center blog has moved! Please visit us at http://evanstonhistorycenter.org/ehc-blog/ for the latest posts. Written by Jacob Slutsky, EHC Intern. 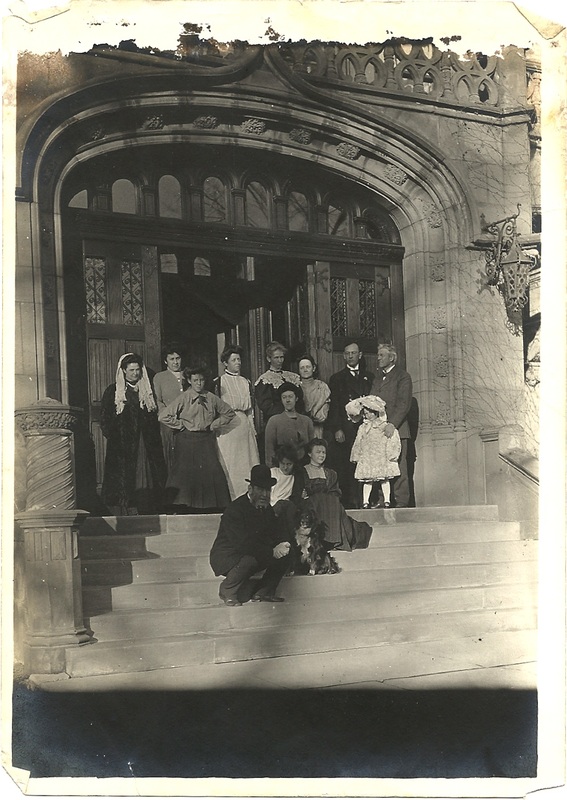 As a collections intern at the Evanston History Center I have had the privilege of working over the last few months with the records of the Dawes Family Collection. I would like to call attention to two artifacts that center around Charles Gates Dawes’s visit to Boston for Patriots’ Day, 1925. I will take this brief opportunity to connect a figure from our local history with the local and state history of the Dawes family in colonial times, Boston, and Massachusetts. The celebration of 1925 was a special year for Bay Staters, for it marked the 150th anniversary of the battles, also known in upper-level vocabulary as the sesquicentennial. Then in his second month of the vice presidency of the United States, Charles Dawes seemed a worthy dignitary to mark the occasion. Of course, aside from his high place in government, the Vice President’s invitation likely stemmed from what is perhaps the most oft-mentioned fact about Charles Dawes’s ancestry: he was descended from William Dawes, a member of the Massachusetts militia famous for riding from Boston to warn of the regulars’ advance in 1775. (5) For these reasons, the visit appears to have been a momentous occasion in the history of Patriots’ Day celebrations. I still love a hero, who fights for a cause. In this event, we see the intersection of our own local history, embodied in one of Evanston’s most famous individuals, with not only the local history of Boston and the state history of Massachusetts in celebrating their role in the American Revolution, but with federal history in the visit of a Vice President of the United States to an institutionalization of our national narrative. 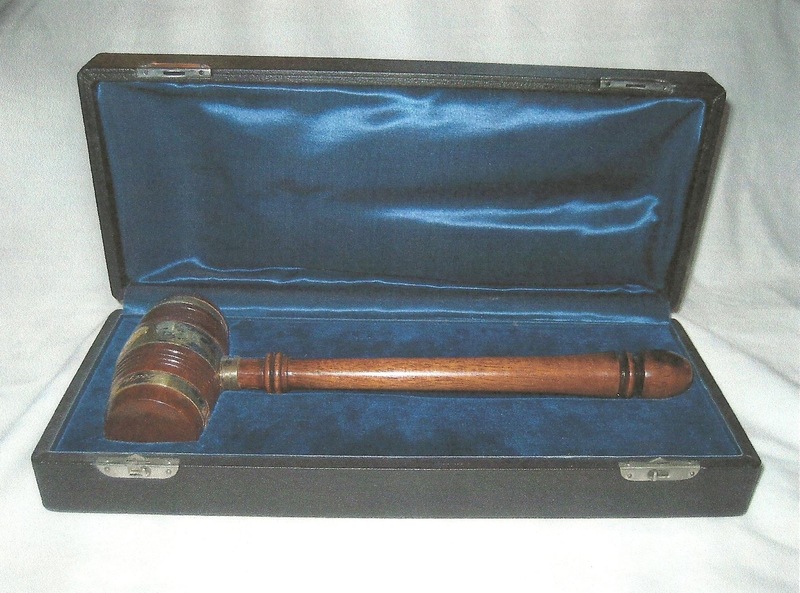 Through our local collection, based largely on events and lives of the late nineteenth and early twentieth century, we can relate, admittedly through several levels of mediation, to events that took place hundreds of miles away at the time of our nation’s inception. 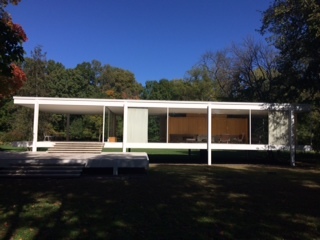 Carr, Marietta. 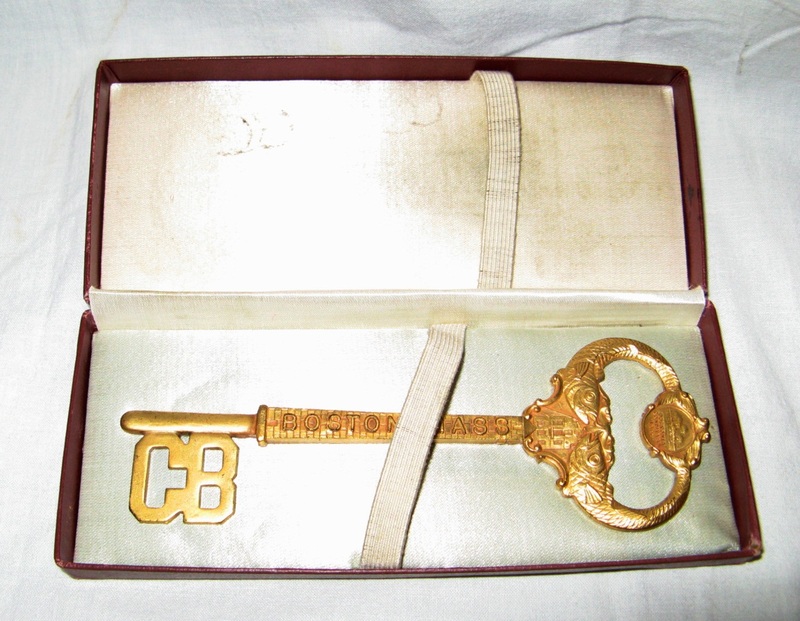 “Keys to the City.” State Library of Massachusetts Blog, March 5, 2010 <http://mastatelibrary.blogspot.com/2009/11/keys-to-city.html>. Accessed April 1, 2015. Nesmith, James Earnest, The Life and Work of Frederic Thomas Greenhalge, Governor of Massachusetts. Boston: Roberts Brothers, 1897. “The Midnight Ride of William Dawes.” The Paul Revere Heritage Project. 2007, <http://www.paul–revere-heritage.com/midnight-ride-william-dawes.html>. Accessed April 1, 2015. “Vice President Dawes in Boston for Celebration.” Boston Daily Globe, April 17, 1925, A1. “Gen Pershing Gives Medal to Boy Hero.” Boston Daily Globe, April 19, 1925, 1, 15. “Pershing and Dawes Plead Nation’s Cause.” Chicago Daily Tribune, April 20, 1925, 1. “1500 See ‘Dawes’ Start From Eliot Sq, Roxbury.” Boston Daily Globe, April 21, 1925, 11. “Dawes Given Gloves Worn by Great-Great-Grandmother.” Boston Daily Globe, April 21, 1925, 23. “Dawes Shovels Cambridge Dirt.” Boston Daily Globe, April 21, 1925, 23. “Tax Receipt of His Ancestor is Given Dawes at Arlington.” Boston Daily Globe, April 21, 1925, 11. “Vast Throng in Lexington,” Boston Daily Globe, April 21, 1925. 1, 17. “Dawes Cheered by 2500 in Armory at Concord.” Boston Daily Globe, April 21, 1925, 8. 1 James Earnest Nesmith, The Life and Work of Frederic Thomas Greenhalge, Governor of Massachusetts (Boston: Roberts Brothers, 1897), 295-296. 3 Maine Revised Statutes, Title 20-A, Chapter 209, §4802, 1: Unconditional Holidays (1981). 4 “Course Map,” Boston Athletic Association, <http://www.baa.org/races/boston-marathon/event-information/course-map.aspx>, accessed April 1, 2015. 5 “The Midnight Ride of William Dawes,” The Paul Revere Heritage Project, 2007, <http://www.paul-revere-heritage.com/midnight-ride-william-dawes.html>, accessed April 1, 2015. 6 “Vice President Dawes in Boston for Celebration,” Boston Daily Globe, April 17, 1925, A1. 7 “Gen Pershing Gives Medal to Boy Hero,” Boston Daily Globe, April 19, 1925, 1, 15; “Pershing and Dawes Plead Nation’s Cause,” Chicago Daily Tribune, April 20, 1925, 1. 9 “1500 See ‘Dawes’ Start From Eliot Sq, Roxbury,” Boston Daily Globe, April 21, 1925, 11. 10 “Dawes Given Gloves Worn by Great-Great-Grandmother,” Boston Daily Globe, April 21, 1925, 23. 12 “Dawes Shovels Cambridge Dirt,” Boston Daily Globe, April 21, 1925, 23. 13 “Tax Receipt of His Ancestor is Given Dawes at Arlington,” Boston Daily Globe, April 21, 1925, 11. 14 “Vast Throng in Lexington,” Boston Daily Globe, April 21, 1925, 1, 17. 15 “Dawes Cheered by 2500 in Armory at Concord,” Boston Daily Globe, April 21, 1925, 8. 16 “Pershing and Dawes Plead Nation’s Cause,” Chicago Daily Tribune, April 20, 1925, 18. 18 “Old North Church,” National Park Service <http://www.nps.gov/bost/learn/historyculture/onc.htm>, accessed April 1, 2015. 19 Marietta Carr, “Keys to the City,” State Library of Massachusetts Blog, March 5, 2010,<http://mastatelibrary.blogspot.com/2009/11/keys-to-city.html>, accessed April 1, 2015. Lori Osborne, Director of Archives & Outreach at the Evanston History Center, in celebration of Women’s History Month in March, joined Paige Harrington, Executive Director of the Sewall-Belmont House & Museum, Dr. Rosalyn Terborg Pen, University Professor Emerita, Morgan State University, and Kristina Myers, Program Director at the Alice Paul Institute, for a discussion on how the temperance and woman suffrage movements of the late 19th and early 20th centuries created opportunities for women to organize for social, economic, and political change. Support for the temperance movement through the largest women’s organization, the Woman’s Christian Temperance Union, opened the door for women to work not only for temperance, but for issues including improved working conditions for wage-earning women, improved public education, and political equality. The discussion provides a fascinating look at the individuals who participated in both movements, the organizations they created, and women as the driving force behind significant change in the United States. To view the discussion, click here. You will be taken to the US National Archives YouTube page. Written by Jill Kirk, Director of Development. 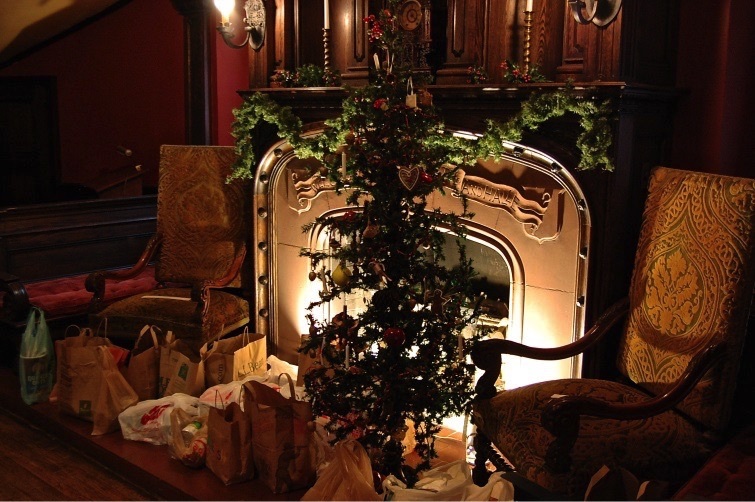 Each year, members of the Evanston History Center “family”– trustees, volunteers and staff – join forces to decorate the Dawes House for the holidays. This is no small task and not for the faint hearted! Three trees (including a towering 12 foot one in the library) are all decorated with ornaments representing different periods in history. The tree in the library is decorated a la 1920s with elaborate ornaments and electric lights similar to ones available by that time. 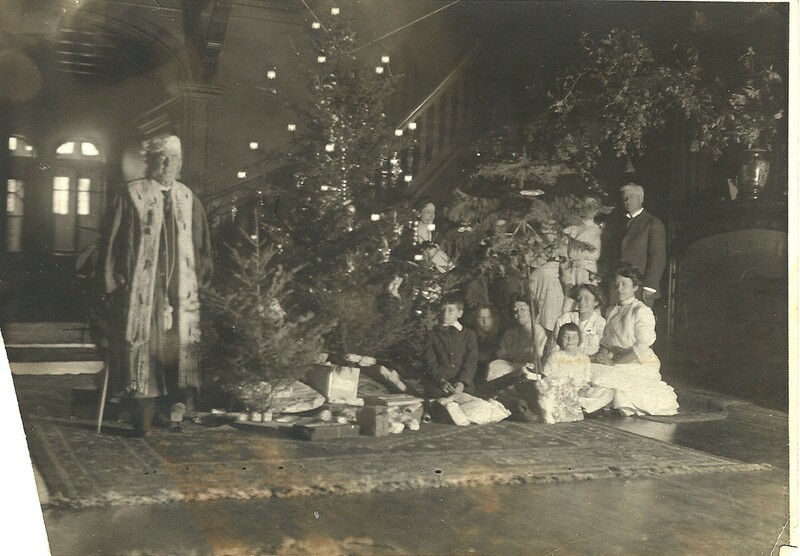 The Dawes’ servants decorated a large tree in the library at night on Christmas Eve with lights, tinsel and German-made glass ornaments, topped by a Santa figure with real fur and whiskers. The tree in the east parlor is decorated with original and replicated ornaments from the 1890s and electric “candles.” Originally trees were lighted with wax candles held on the branches of the tree with small metal clip candleholders. The candles were lighted on Christmas Eve for only a few minutes and a bucket of water or sand stood by to extinguish any accidental flame. 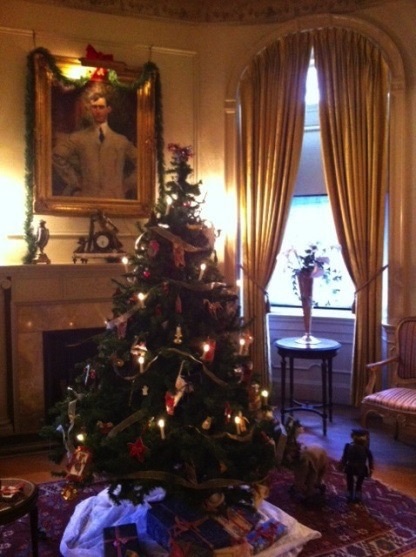 Look closely and you will see under the tree a toy Prussian soldier and an elephant pull toy that belonged to Dana Dawes. The feather tree on display in the Great Hall by the fireplace is part of the EHC’s collection and dates from the 1930s. Feather trees were produced by Germans as early as 1840 and were still in production through the 1930s. 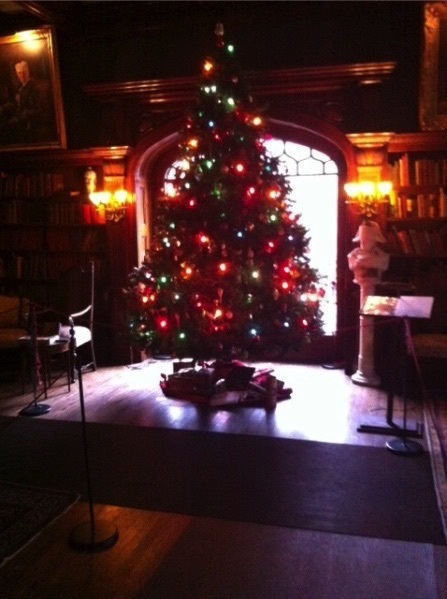 This tree represents the earliest period and is decorated in the sparse Victorian Christmas traditions of the 1870s. The bags of food were the generous donations from individuals for EHC’s 9th annual food drive, which we do in partnership with the Greater Chicago Food Depository. The Dawes House is open for tours during the holiday season on Thursday-Sunday from 1pm-4pm, except for Christmas Eve, Christmas Day, New Year’s Eve and New Year’s Day. A special holiday tour, Brighten the Nights, will be taking place on Wednesday, December 17 and Thursday, December 18. Click here to learn more about the tour! Written by Kris Hartzell, Director of Facilities, Visitor Services and Collections, as well as our resident architectural historian. The work on keeping up an historic house is never done and problems come in all sizes, great and small. 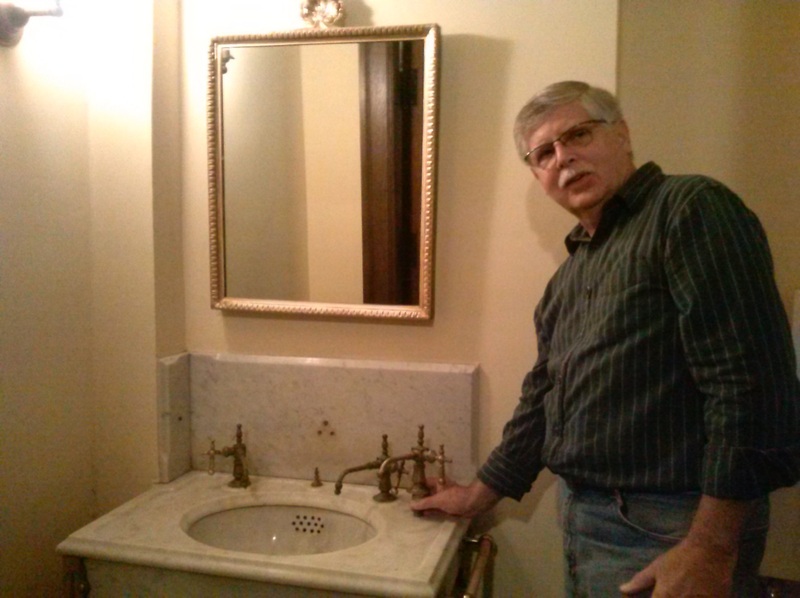 The historic sink in the first floor bathroom is original to the house, the only sink that Dawes did not replace when he updated the house after purchasing it in 1909. The sink is marble with beautiful brass fixtures. The fixtures date from 1894 when Robert Sheppard built the house. One of the faucets has not worked for several years. Steve Brunger, our intrepid building engineer, has made every effort to restore the faucet to functioning order. Needless to say, however, parts are not easy to come by. Years of searching and calling plumbers came up dry. But we are a dedicated staff and we are always carrying the Dawes house with us in our hearts. This past weekend, while browsing a flea market in Wisconsin, Steve’s trained eye fell upon the identical faucet in a pile of plumbing fixtures. For $5 he came back with it. Upon presentation to the rest of the staff, we all began to speculate: was it exactly the same? There were differing viewpoints. No, the handle is longer. No, the spout is longer. No, it doesn’t have the finial on the top. Steve maintained that it was identical. So, we all trouped into the bathroom to compare. Bingo! Steve was right. Not only is the fixture identical in style, but it is the proper orientation as the one that is malfunctioning – with the handle on the right. Bravo!!! And now we even have an option. The ideal would be to swap out the inner parts so that the original fixture that was originally installed in the house remains in place. If that does not work, we can always swap it with the replacement fixture. Here is Steve in his moment of triumph. Sometimes in our work here at the Evanston History Center the past seems more present than at other times. Two great examples of this can be found right now on the north side of town. 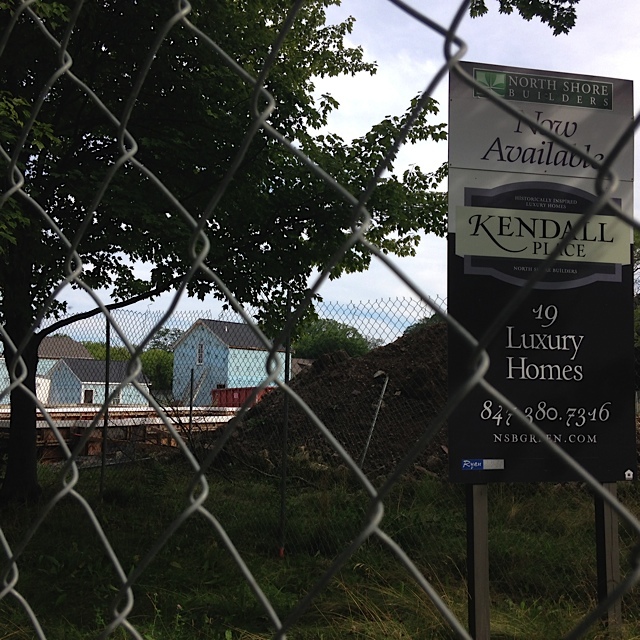 The first is the new construction that’s been going on all year on what was the Kendall College site bounded by Lincoln, Sherman, Colfax and Orrington streets. It is rare in Evanston these days to see whole blocks under construction, but this is exactly what many areas of Evanston looked like in the early 20th century when so much construction was underway on vacant land all over town. By the 1960s most land in Evanston was built on and it was hard to find even one vacant lot. Drive by and see for yourself what vacant land looks like as it slowly fills up with new houses and garages, fences and alleys. 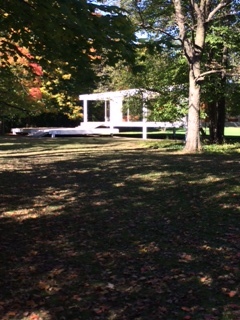 The second happened just last week – a house being lifted off its foundation and moved from its original location, rather than being torn down. The house at 1318 Isabella had sat on its Wilmette lot for more than 80 years until purchased by a developer who intended to tear it down for new construction. Designed by architect John Van Bergen, who worked in the studio of Frank Lloyd Wright, the prairie style house became the focus of preservationists who lobbied for saving it. The developer agreed to hold off on demolition, as long as a buyer could be found who would move the house to a new location. And this is how on a sunny October Friday, one could visit Isabella Street and watch one section of this house travelling from its former to its temporary home in the old Dominicks parking lot. In our much more disposable-minded age, house moving is very uncommon. 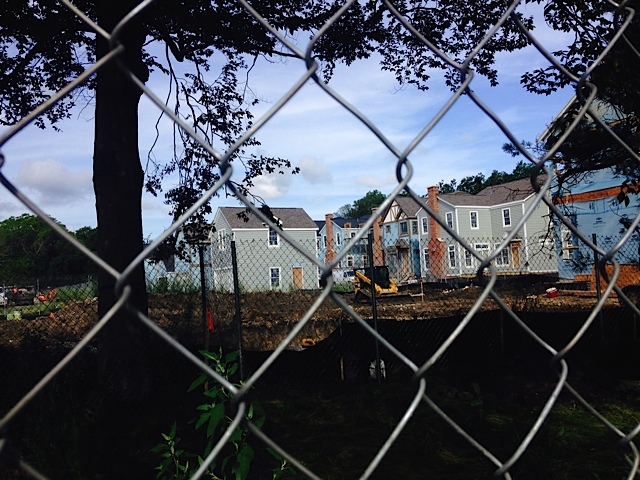 Most of the time the older home is simply leveled for new construction. 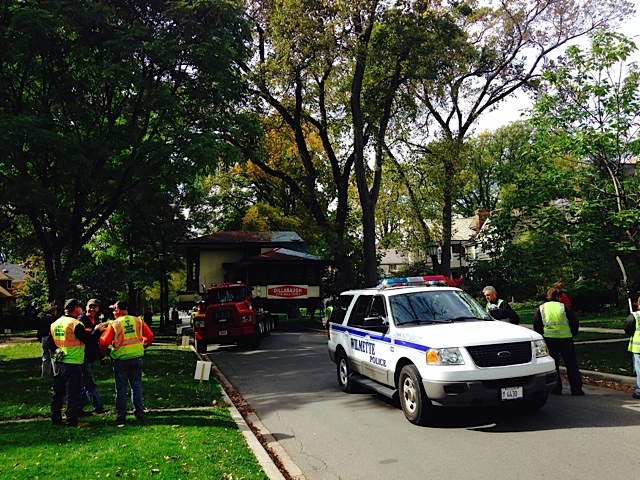 But thankfully for the Van Bergen house, wiser forces prevailed and this historic home was saved. We can’t wait to see how it looks once it is pieced back together and in place at its new home. A Visit to Washington, D.C.
We are pleased to share EHC Docent Matthew Marchione’s blog of his recent trip to Washington, D.C.. Matt brought along his years of experience interpreting the Dawes House for our guests, combined with his training in historic preservation – and his camera – to give us a virtual tour of many of the wonderful historic museums in the area. 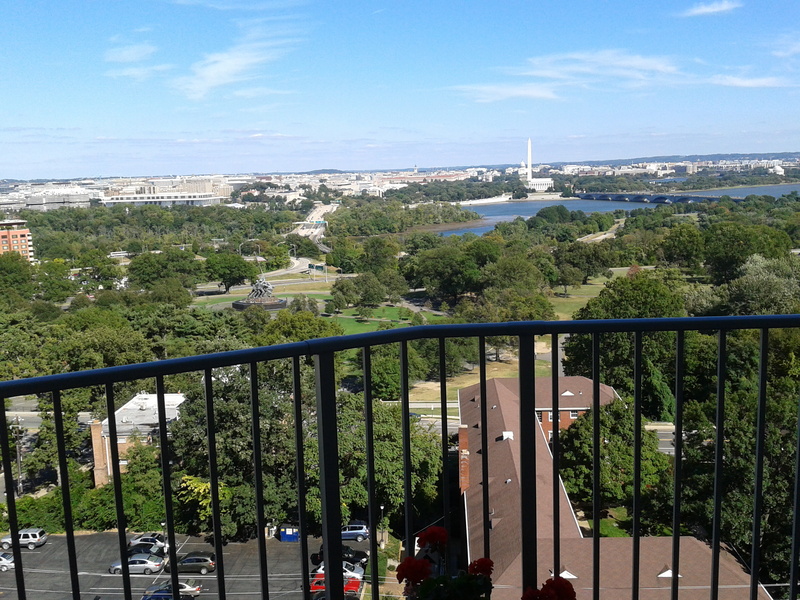 View of the Washington Monument. From Lincoln’s Cottage to Clara Barton and Mary McLeod Bethune, you can enjoy a visit to an interesting mix of historic sites beyond the beaten path. And, we love his women’s history focus. Thank you, Matt! By Thomas Kingsley. Thomas Kingsley is a retired attorney who is inspired by the character and history of Charles Gates Dawes, and by the extraordinary architecture and interior design of the Dawes House. As a volunteer docent, he shares his enthusiasm with our visitors. As we are proud to acknowledge, Charles Gates Dawes, the 30th Vice President of the United States, resided at his magnificent chateauesque residence on Greenwood Street from 1909 and throughout his professional life. Thereafter, he ensured that the stately home would be preserved as a legacy to the community of Evanston. As we also know, this imposing house was conceived and built by Robert D. Sheppard in 1894 as a home for his family and as a place by which to further his professional aspirations at Northwestern University. The Sheppard family on the front steps of 225 Greenwood Street. In 1909, the house was sold by Robert D. Sheppard to Charles Gates Dawes. It is believed that there was no further contact either personally or professionally between the Dawes and Sheppard families for over one hundred years…….until now. Just prior to our scheduled Ice Cream Social, we received a telephone call from George Wing, Grandson of Dorothea Sheppard, Daughter of Robert D. Sheppard. To our surprise and delight, Mr. Wing advised us that his Daughter, Jessica Smith from the State of Washington would be traveling in the Chicago Area on the weekend of July 26, 2014, and would love to pay a visit to the former residence of her Great Grandfather. We were quick to respond that the Great Granddaughter of Robert D. Sheppard would be truly welcomed at the Dawes House. 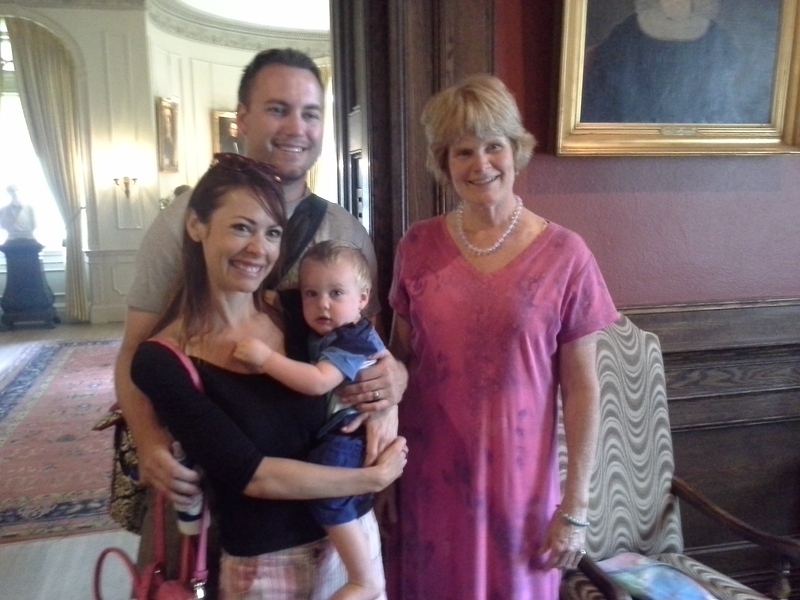 On the day of the festive Ice Cream Social, Jessica Smith, her husband Phillip and their lovely daughter Rebecca arrived at the Evanston History Center, were warmly greeted by members of our staff and were given a private tour of their family’s previous home. It is always a delight to share the unique features of the exquisite interior of the home with guests, whether it be the wonders of the coffered ceilings, the stained glass, the wood paneled Library, the carved moldings, or the extraordinary design of the Dining Room, Music Gallery and, of course, the Great Hall. In this particular instance, however, the opportunity to share the decorative and lasting interior art of the home’s design with a direct descendant of the very person who conceived and built it , was an extraordinary moment. As we toured the house together frequent reference was made to one of our important publications: AT HOME IN EVANSTON: THE CHARLES GATES HOUSE, published in 2000. The chapter by Mark Burnette pertaining to Robert D. Sheppard was of enormous significance to Mrs. Smith. She had never seen the early photographs of her family, some of them taken more than one hundred and twenty years ago. The photograph of her Great Grandfather posing as Santa Claus next to the Christmas Tree and his family and taken in the Great Hall was a wonderful moment. 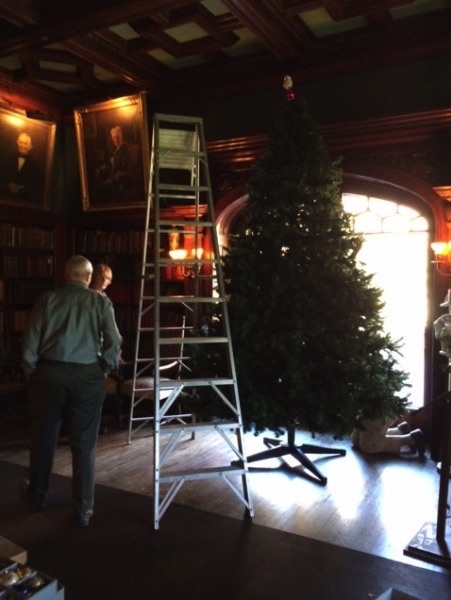 It was explained to her that the tradition of the Tree in the Great Hall was continued by Charles G. Dawes and even to this day by the Evanston History Center. The Sheppard family surrounding their Christmas tree in the Great Hal. Similarly, Jessica Smith had never seen the photograph of her Great Grandfather leaning against the east terrace wall in a stately, though relaxed posture of 1900. The photograph taken of the entire Sheppard family in 1898, when her Grandmother Dorothea was only 8 or 9 years of age brought tears to all of our eyes. 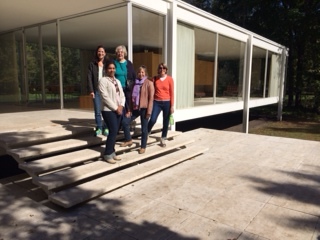 The most important and perhaps seminal moment of this special tour occurred toward the end of their visit. Marian McNair is, of course, a special friend of the Evanston History Center, one of our revered benefactors, and one who frequently attends and participates in the numerous social and professional activities presented by our staff. Marian McNair is also a Great Granddaughter of Charles Gates Dawes. To our delight, Ms. McNair was also attending the Ice Cream Social on that day and our staff arranged to introduce her to the Jessica Smith family, a warm and amiable exchange which took place in the East Parlor. The historic significance of this moment was palpable as the Great Granddaughter of Robert Sheppard and the Great Granddaughter of Charles Dawes stood together in this beautiful home. For the first time in over one hundred and ten years, the two families who were responsible for the design and construction of this wonderful chateau, and for its preservation and legacy, were reunited at last. This important chapter in the history of our wonderful House will not be forgotten. By Lori Osborne. Lori is the Director of Archives & Outreach at the Evanston History Center. You may have seen the headline in the past month or so in Crain’s Chicago Business – When Did Evanston Get Hip? The article highlighted Evanston’s new “foodie” culture where suddenly you can get farm fresh produce, fresh baked bread and farm-raised meat in our small city without blinking an eye. You too may have noticed that traffic has picked up, restaurants are packed, the movie theater is busy at all hours, even the library is bustling with activity. I love Evanston, so of course I’m glad to see a thriving day and night scene here. It is good for all of us to live in a place that is growing, changing and bringing in new people. But here at EHC we know that this is not really a new thing. Evanston may be “hip” now in a new way, but it has been “hip” before and here’s where a little history makes the story more interesting. In its earliest days, when Northwestern University had newly located to the patch of high ground along the lakefront and mapped out the surrounding town, Evanston proved attractive to those who wanted to escape the chaotic frontier city of Chicago. In the 1850s and 60s, Methodists, abolitionists and temperance advocates thought “Heavanston” the ideal place to live. They laid out streets, built homes, planted trees, started churches, the library, and the fire and police departments, and in general laid the foundations of the community we still live in today. Some years later, after the Great Chicago Fire in 1871, a new group of people found Evanston “hip.” These people came here for the suburban feel of the town – commuter trains running to and from Chicago, tree-lined streets, parks and good schools. They built the grand Victorian-style homes that are so common in the neighborhoods near downtown. 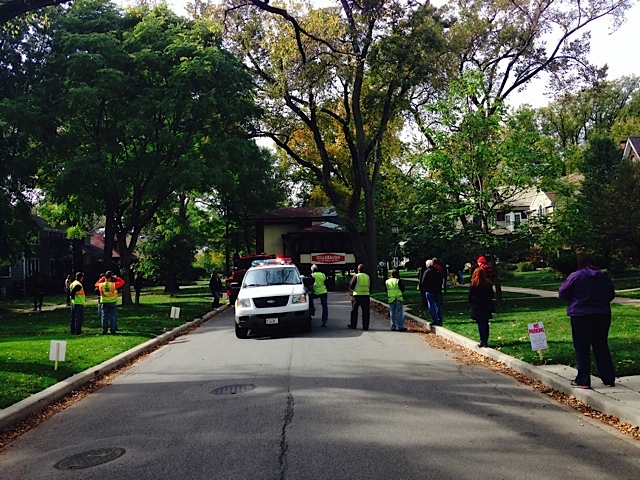 And they contributed their time and resources to make Evanston a beautiful and wholesome place to live. At the beginning of the 20th century, and especially following World War I, many African Americans found Evanston a desirable place to live. Good jobs could be found in the city’s growing west-side industrial area, and to some extent the racial tensions of Chicago could be avoided here. 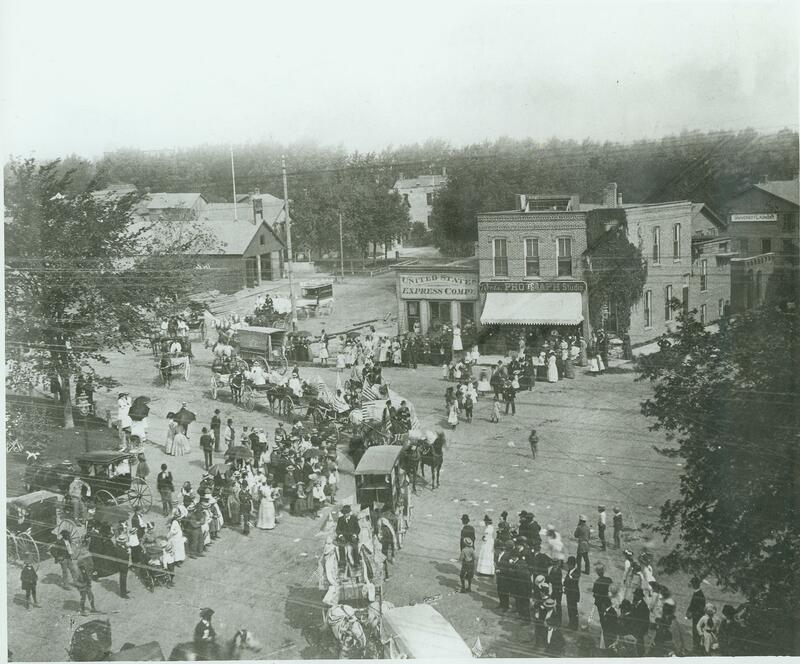 African-Americans had lived in Evanston starting in the 1850s, but by the 1930s a thriving business district and dozens of clubs, organizations and churches served this large and vibrant community. This same phenomenon proved true for immigrants from Poland as well. The neighborhood around Florence Avenue was the center of their community. Both of these communities suffered greatly when Evanston’s industrial economy collapsed in the 1960s and 70s. In the 1920s, Evanston found itself “hip” in a new way when it became known as the “Shopping Center of the North Shore.” Downtown Evanston had several mid-sized department stores, including a Marshall Fields at the corner of Sherman and Church (where Panera is today), as well as lots of small businesses and restaurants. Female shoppers with the freedom of time and resources found it an attractive place to spend the day. Traffic and parking became such a problem that the city implemented one way streets and the original fountain in Fountain Square (which stood in the center of the intersecting streets there) was moved out of the way. Downtown Evanston retained this status until Old Orchard Mall was built in the 1950s. Of course, Evanston’s current “hip-ness” is not the same as it was. The biggest difference is that in all those earlier years, Evanston was a dry town, meaning that no alcohol was served at any public establishment. That, of course, is not true today, when breweries and distilleries seem to be cropping up on every Evanston corner! But, many of the reasons Evanston was attractive back then are still the same. 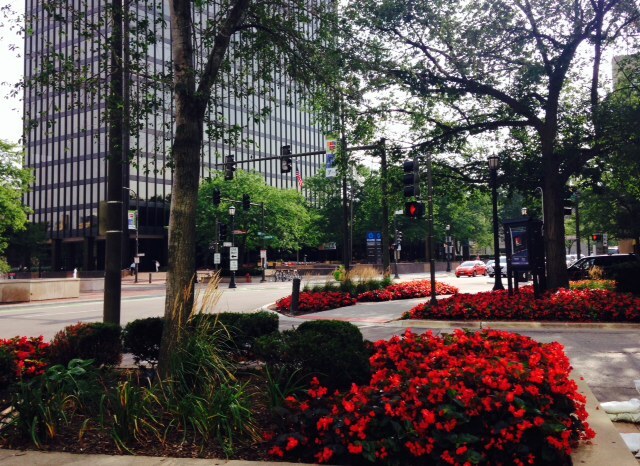 Our tree-lined streets, beautiful lakefront, good schools and lovely homes, still bring people to live and work here. Welcome to all those who’ve just discovered how “hip” an old town can be. And, for more on Evanston’s “hip” history, visit the Evanston History Center!